I’ve been reading that greens give you energy. I’m not sure how much I believe this, something about the alkaloids in raw greens equal the alkaloids in coffee. As far as I’m concerned, nothing can replace my coffee haha. But it can’t hurt right? More energy, sign me up! Prepare vinaigrette dressing by combining oil, lemon juice, vinegar, mustard, garlic, salt, and pepper in a food processor. Blend until smooth. Bring chicken broth to a boil in a small saucepan. Stir in couscous, remove from heat, and cover. Let stand for 5 minutes then fluff with a fork. Stir couscous, lentils, and 1/4 cup of the dressing together. Divide arugula, cucumber, and tomatoes among 4 plates. 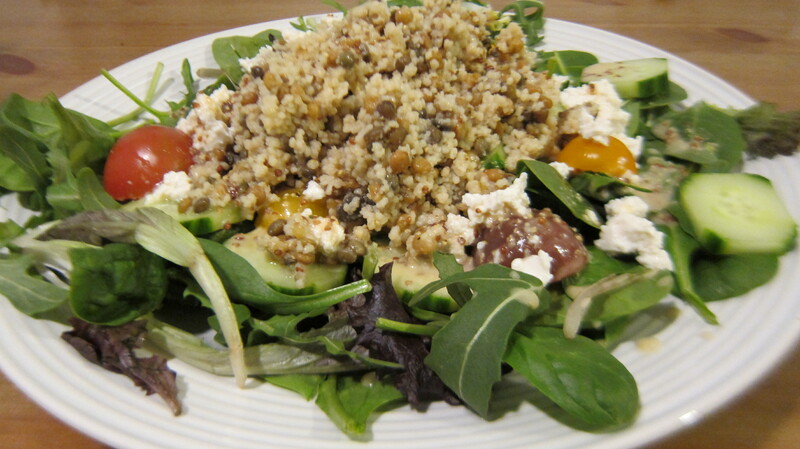 Top each salad with couscous/lentil mixture and sprinkle on tofu. Add more dressing to taste. Now, normally I’m a meat person but I really liked this salad. I enjoyed the tangy kick of the mustard and loved that the couscous and lentils left me with a pleasantly full feeling!